I'm sorry but I just can't get enough of this pinstripe coat. It has been my best sale buy this year by far (cost per wear an all!) I couldn't help go for a double pinstripe in form of these Front Row Shop trousers. (Topshop have an identical set with a matching blazer, FYI) I can't get enough of tailoring at the moment, all I can think about its a pair of camel slim fit cigarette pants with a matching jacket, or just a matching tailored suit in general. Weworewhat, I have you to blame! What do you think about these Asos celine-esque slip on's? The best version I've seen so far. Asos give yourself a pat on the back! I love how they look with this outfit, these shoes can officially be worn with anything and do no wrong. 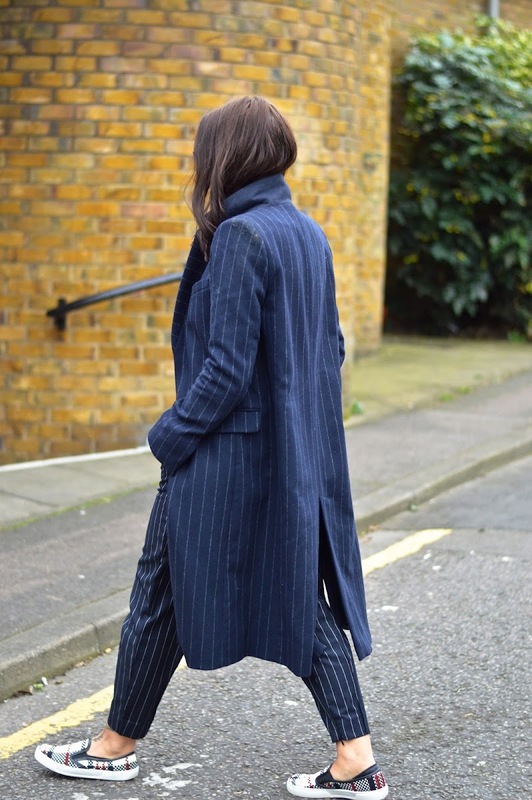 I adore the pinstripe coat! This look reminds me loads of Victoria Beckham.. just need to swap the flats for heels! Love it though. Rocking the tailored feminine look!